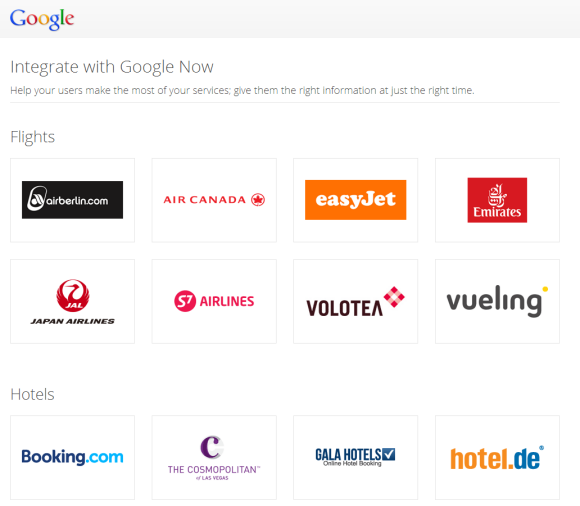 There's a long list of sites that integrate with Google Now: Air Berlin, Air Canada, Emirates, Booking.com, Lastminute.com, TicketWeb, Ticketfly, Orbitz, CheapTickets, OpenTable, Fandango, Rotten Tomatoes, Zillow and more. There's nothing magic about integrating travel sites, hotel booking sites, event-ticketing sites with Google Now. You only need to add some markup to email notifications. "By adding schema.org markup to the emails you send your users, you can make that information available across their Google experience, and make it easy for users to take quick action. Gmail, Google Search and Google Now all already use this structured data. (...) Google Now brings users the right information at just the right time. For example, Google Now already provides updates to restaurant and hotel reservations or flight information received in Gmail. By marking up email notifications to your users, you can use Google Now to bring them similar updates about your services and products." After an email confirming a hotel reservation, the Google Search app shows this card. Here are some examples of code that needs to be added to email notifications. 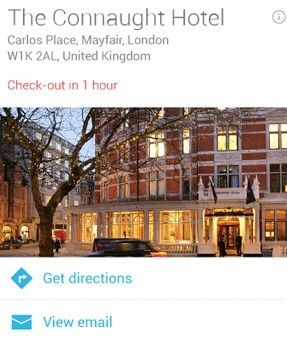 Google Now only supports schemas for event reservation, flight reservation, hotel reservation and restaurant reservation.